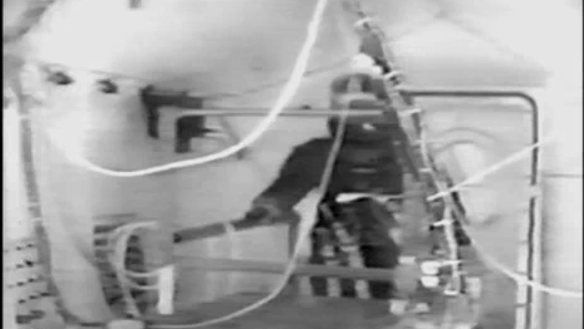 What happens when a space suit depressurizes in vacuum? On December 14, 1966, NASA spacesuit technician and test subject Jim LeBlanc found out. Suited up in an early Moon suit prototype, he entered a triple-doored vacuum chamber. Then, his pressurization hose somehow became disconnected and LeBlanc became the only person to survive near-vacuum pressures when his suit dropped from 3.8 psi to 0.1 psi in 10 seconds. “As I stumbled backwards, I could feel the saliva on my tongue starting to bubble just before I went unconscious and that’s the last thing I remember,” recalls LeBlanc. The chamber – which would normally take 30 minutes to repressurized – was blasted back to atmospheric pressure in 87 seconds. Amazingly, LeBlanc survived with just an earache to show for his ordeal. That really was a close call in the spaceflight history. But space is a vacuum? Why weren’t the moon astronauts at all concerned with leaks, why isn’t the ISS? This raises so many questions.